It is now possible, within a Data Process Transformation, to select new options for a Criteria Filter. First, the On Record Added Filters will cause the Transformation to only be triggered when a record (or records) is being added to the Table. Next, the On Record Updated Filters will only trigger the Transformation when a record (or records) is updated within the Table. Finally, Transformations with On Record Deleted Filters are not triggered unless a record (or records) is deleted from the Table. There are two different options that determine the timing of the Transformation in relation to the deletion of the record. The first, On Record Deleted Pre, is triggered directly prior to the deletion of the record. This makes it easy to create Transformations that rely on record data available at the moment of deletion. The second, On Record Deleted Post, is triggered directly after to the deletion of the record. 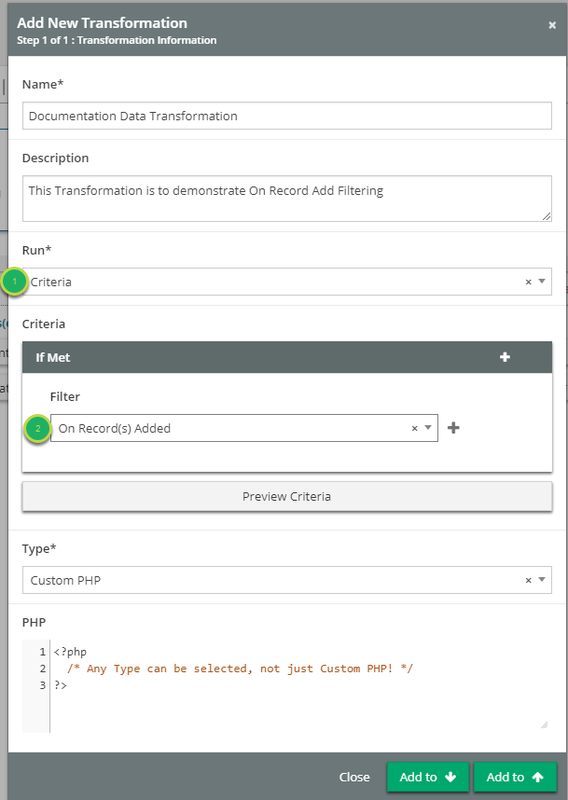 Tables that require Transformations to be re-run every time a record is removed will benefit from this Criteria Filter. These new options will afford users even more flexibility when creating Data Transformations by granting greater control over when they can be triggered. Under Run, select: Criteria from the drop down menu. In the If Met section that appears, select On Record(s) Added from the drop down menu under Filter. In the If Met section that appears, select On Record(s) Updated from the drop down menu under Filter. In the If Met section that appears, select On Record(s) Deleted Pre from the drop down menu under Filter. In the If Met section that appears, select On Record(s) Deleted Post from the drop down menu under Filter. Prev: HubSpot Connector Now Available!